Currently reading: You’ll notice a pattern in this post. It’s exactly the same as last week. Yep. I’m really close to finishing A Widow for One Year by John Irving and I’m banking on finishing it by next week. I feel like there’s a lot of action still to go, but the disk count shows that I’m close to the end so we’ll see how Irving wraps this one up. I’m almost halfway through Harry Potter y las Reliquias de la Muerte by J.K. Rowling which I see as a big accomplishment. I did a lot of reading on a snowy day that kept me indoors all day and got through about 50 pages in one day! And I didn’t have to take a nap afterward! I’m almost halfway through My Brilliant Friend by Elena Ferrante. The weather has made it hard to get out for my long runs which is where I make great progress on this one. Maybe the book fairies will give us a break in the weather so I can listen more? Or maybe we’ll get another 11 inches, who knows? I’m barely making progress in The Circle by Dave Eggers. It’s going to be a long haul on this one. That’s nothing against Eggers or his book, just the nature of my ebook reading that keeps it slow and plodding. This will slowly make its way to the top of this paragraph as it sits on my ‘Currently Reading’ shelf for ages. Recently finished: Sadly, nothing again. I don’t even have any reviews to report on. It’s just been that kind of week. Reading Next: I’ll be getting Son of a Witch by Gregory Maguire from the library this week so I can start it right away. I hope I remember enough from the first book to dive into this one without too many problems! I also plan on starting Pigs in Heaven by Barbara Kingsolver when I finish Ferrante’s book. I read the first book in this duology a few years back but I remember it pretty well. I adored that the small girl was named Turtle! I’m excited to hear more about her. It’s the sequel to The Bean Trees. Happy reading! Thanks! I’m trying to look forward. Happy reading! Thank you! I wish it showed by finishing some titles! Happy reading! Haha just keep reading, just keep reading! We’ll get there. Happy reading! Thanks! I’ve got to finish some books first so I can review them. I’m getting close to a few. Happy reading! Some books need to be read slowly, I’ve not read The Circle so don’t know what it’s about. I’ve heard lots of good things about ‘Son of a Witch’, hopefully you will enjoy it. Thank you. The Circle is a bit unnerving because it’s very real to life but shows how things can go badly. Happy reading! I’ve been meaning to read Pigs In Heaven ever since I read The Bean Trees 2 years ago – I hope you enjoy it. Thanks! I’ve been meaning to read it since I finished the first, too. Happy reading! Thank you. I’m excited to finish one at least. Happy reading! How did you like Origin? I want to read that one soon. Happy reading and thanks for participating in WWW Wednesday! Happy Wednesday! This is my post for the week. The Poisonwood Bible was a good one. I think I’ve read it twice now. I liked The Bean Trees so I’m excited to read another one in the series. Happy reading! Thank you!! I hope next week can calm down a bit. Happy reading! My Brilliant Friend sounds promising. I look forward to hearing about your progress. I’ve got two books to discuss this: a biography of a very proper lady, and a true crime book about an infamously improper young man. I really hope to report finishing a few books next week! I hope you enjoy your books this week. Happy reading! I like the cover of Pigs in Heaven. I’m looking forward to finding out what’s behind the cover. Happy reading! I’d love to curl up with a Harry Potter book on a snowy day – sounds perfect! I can’t think of anything better. It was a great day. Happy reading! I wish I could remember what happens at the end of Widow for One Year, but unfortunately, Irving novels all start to run together since I’ve read most of them. I do remember being satisfied by it. 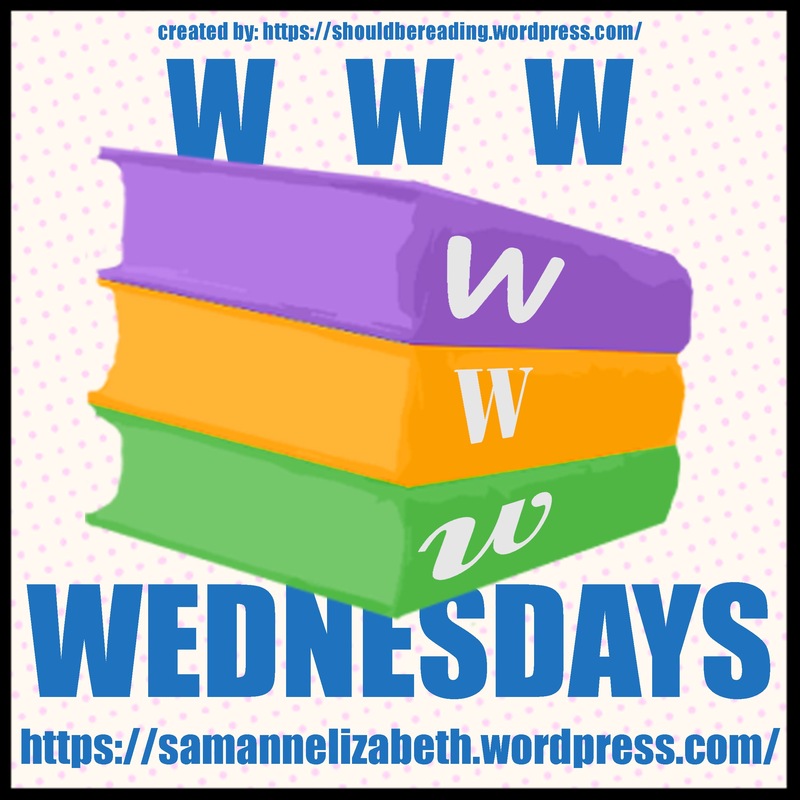 Here’s my WWW Wednesday, happy reading! Haha so true! I’m excited to be so close to the end finally. Happy reading! I feel your pain! I really wanted to have more done this week too, just couldn’t juggle it all as aptly for some reason. I keep being distracted by the Olympics haha. Happy reading! I think I’ll finish some books so I’ll have something to review haha. Happy reading! Hello Sam!!! I know how it feels, not complete books as you expect. I am a slow reader too. But stay strong and work hard. I loved the books that are mentioned. Hope you will enjoy mine too!!! Glad you enjoy them. Sometimes I think I shouldn’t juggle so many books. But whats the fun in that? Haha. Happy reading! I loved Pigs in Heaven when I read it! I hope you enjoy Turtle. Thank you. I loved her in Bean Trees and I’m glad to see her again. Happy reading! You’ve made such great progress on your current reads! Have a great week! Thanks! I hope to actually finish them soon lol. Happy reading! It’s been kind of a slow week with reading for me too. I really need to do a reread of Harry Potter. It’s such a joy to revisit the books. I’m having a lot of fun with it. Happy reading! I did like My Brilliant Friend, and Pigs in Heaven, although it’s been AGES since I’ve read that one. Kingsolver is one of my favorite writers. I’ve read two of her books before and loved them so I’m looking forward to that. Happy reading! It’s been a slow week for me too. I’ve been re-reading Harry Potter and trying out some short stories to try to get out of my reading funk. Hopefully this next week will be better for both of us! Amen! I’m trying to snap myself out of it and get through my books. Happy reading! Reading, Dr. Gundry’s Diet Revolution, I need to loose a few pounds. Recently read, Ruta Septys , Out of the Easy, and want to read two books waiting on my shelf downstairs so I don’t recall the titles. The fact that I don’t want to venture down the steps right now, well maybe this is why I need to loose a few. I hope to read a Sepetys’ book this year myself. How did you like it? Happy Wednesday! I loved the setting, characters, the plot, everything about it. Enjoy! Some weeks are like that – at least you’re making headway! Thank you! I feel like I always have nothing or three books finished in a week haha. Happy Wednesday! I will have a word with the weather fairies to bring you some sunshine to enjoy My Brilliant Friend. I’m on holiday at the moment and have all the sunshine I need for reading but will have a ton of reviews to write when I get back. How fun! I’m heading to California later this month so I’ll get some sun then. Happy reading! A lot of cutting and pasting for me in my post this week as well. Lets both am to push something new onto our currently reading for next week! Deal! I’m feeling pretty good about finishing at least one. Happy reading! Thanks! And it’s not too late in my time zone, haha. Happy reading. I’ve used a lot of days to binge shows. I was glad I finally used one for books! Happy reading! I bet The Circle is going to go faster than you think. 🙂 It was so hard for me to put it down, I think I got through it in about a day haha! Happy reading! Oh geeze! I won’t be that fast, I’m only reading it during my lunch break haha. Happy reading! You’ve got lots of good stuff to read! Happy reading! Thanks! I’m enjoying all the reading I’m getting to do. Happy reading! Thanks, I’m enjoying them. Happy reading! So glad I’m not the only one that’s had one of those weeks! I couldn’t even post on time!! Haha better late than never. We always have next week. Happy reading! I think you are the 4th blogger that has a hard time finishing books this month – myself included. Maybe it is something in the air! Let’s blame February for being a short month. Happy reading!